Here are this month’s choices for signs of positive progress in the world. Who doesn’t want more birds and less polluting, land-and-life destroying activity? Earlier this spring, the two major companies who had leases on land in northeastern Pennsylvania decided to cancel their leases, and move out of the area. One of those areas is the county where Josh Fox, the director of anti-fracking films Gasland and Gasland 2 lives, and where fractivist group DCS got its start. The companies sent letters stating that they “have elected to release your lease, thus your lease will not be continued to the development phase,” terminating approximately 1,500 leases covering over 100,000 acres of land. A mining company has retreated from plans to drill for gas at one of Australia’s oldest Indigenous heritage sites, prompting celebrations among traditional landholders. Representatives of the Djungan people of north Queensland in a statement said they were “elated” at news that Mantle Mining had dropped its bid to prospect at the foot of Ngarrabullgan, also known as Mount Mulligan. The Djungan, who have been linked to cultural sites on the mountain for more than 35,000 years, learned last week that the Brisbane-based miner had withdrawn its prospecting application after surrendering its exploration permit last month. Djungan elder Alfie “Pop” Neal thanked supporters, who ranged from the Greens to the Katter party to graziers and mining protest group Lock the Gate. The chairman of the Ngarrabulgan Native Title Aboriginal Corporation, Judulu Neal, said the Djungan supported a nationwide moratorium on fracking, which involves injection of chemicals into coal seams by miners to obtain gas. One of the common threads in both these stories, if not the main thrust, is that the groups heavily involved in these specific places are working with other activists and organizations, creating and becoming part of broader networks that can sustain a long effort and push back on large corporations and governmental problems. It seems at times like these kinds of victories are very isolated, but getting a sense of how they fit into what is quite a large network with a common drive is very comforting. Last month I wrote about the California condor population being slowly brought back; the scarlet macaw population was also nearly wiped out last century, in part due to birds being captured for the pet trade, but laws against capturing parrots, work to breed and release birds, and educational efforts where the birds live, are now helping their wild numbers come up. This spring, we were thrilled to take part in the release of 28 scarlet macaws in Veracruz, Mexico. With just an estimated 250 birds in all of Mexico, these macaws are slowly regaining a foothold in the wild after being nearly wiped out. With the release of 27 macaws last year, and this release of another 28, the population has increased by around 20%. To help bring back one of the most iconic species of our rainforests, Defenders is working in partnership with the Mexican National University’s Institute of Biology. 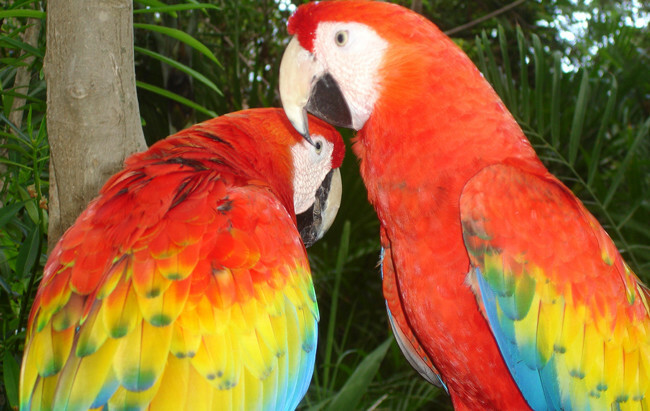 The effort to reintroduce the scarlet macaw to the rainforests of the Biosphere Reserve of Los Tuxtlas has been years in the making, and in the last year we have seen our efforts literally take flight. We and our partners have been working continuously in local communities and schools to teach them about the plight of the scarlet macaw, the environmental laws protecting them, the reintroduction project and its importance for the species and the communities. We supply the field team with posters, coloring books for children and comic books for youths and adults that describe the threats that drove this species from the area in the 1970’s, and how the people who live in the bird’s range have the power to help protect it. This work has already paid dividends —several children have alerted the team when they learn of macaws flying into homes, or of someone trying to capture them. In this way, we can help inspire local communities to play an active role in protecting scarlet macaws. I like the Lu Xun quote! Here’s hoping the decision is -against- it! Absolutely! I’m able to make the protest on the Tuesday am but work demands I have to go to Liverpool to prepare for and help run a conference that afternoon and the rest of the week. Gutted! My prayers will be with the protestors though.